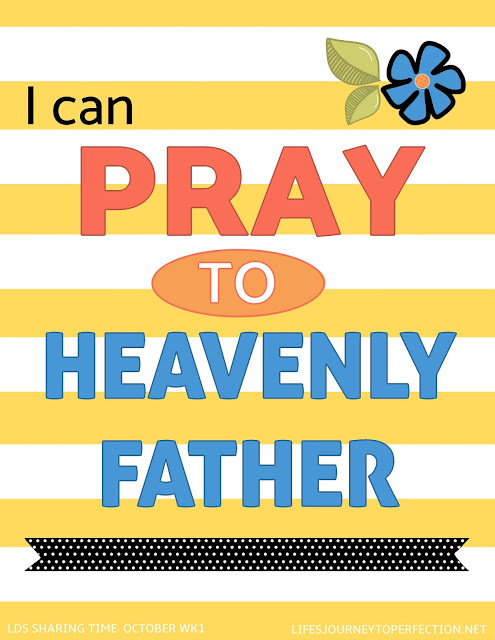 Life's Journey To Perfection: 2016 LDS Sharing Time Ideas for October Week 1: I can pray to Heavenly Father. 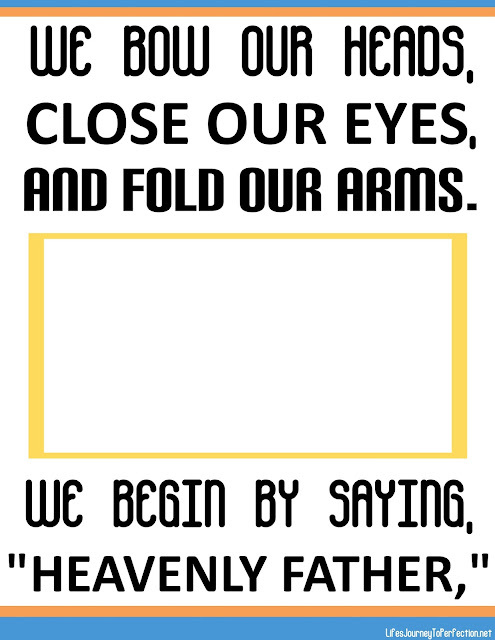 October Week 1 Topic: I can pray to Heavenly Father. Begin by showing the primary children a phone, a letter, a picture of two people talking, and a computer and ask the primary children what those things have in common? They are ways of communicating. Ask the primary children if any of them has a friend or family member that lives far away? How do they communicate with them? Explain that we have a Heavenly Father that loves us so much that when he sent us to earth he made a way that we could talk to him. Ask the primary children how can we talk to our Heavenly Father? 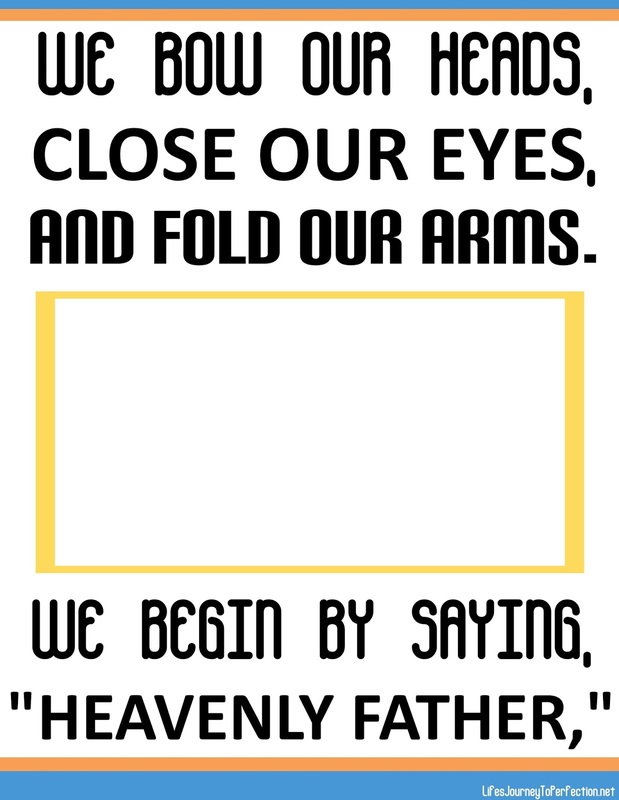 Show the primary children the week's theme poster and invite them to repeat, "I can pray to Heavenly Father". Explain that Heavenly Father wants to hear from us everyday! He wants us to tell him how our day was, he wants us to tell him the things we are thankful for, he wants to know when we are hurt or sad, or when we need his help. We can do this as we pray to our Heavenly Father. Explain that in the scriptures we learn how to pray to our Heavenly Father. 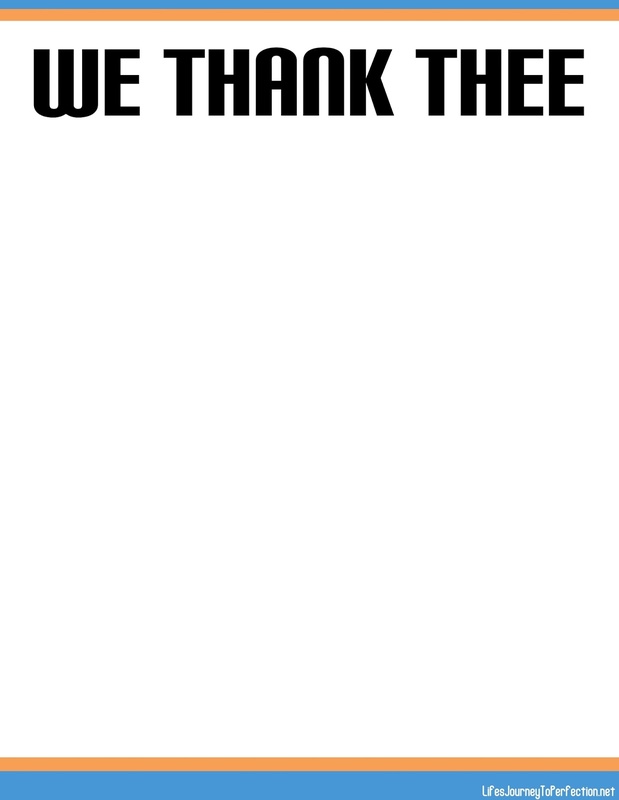 Show the primary children the poster that says, "We bow our heads.... " Explain that when we talk to a friend we usually say their name before talking to them, that way they know it is them we are talking to. When we pray to Heavenly Father, we begin our prayer by saying, "Heavenly Father." There are also some things we need to do when we pray to Heavenly Father, we bow our heads, close our eyes, and fold our arms. Invite a primary child to come up and draw a picture on the poster, to help the primary children remember those three things. Invite the primary children to show you how they get ready to pray. Explain that we do these things to help us focus on our Heavenly Father and feel closer to him. Next, show the poster that says, "We thank thee..." Explain that in our prayer we should thank Heavenly Father for the many things that he has blessed us with. Ask the primary children what some things are they could thank Heavenly Father for in their prayers? Write these answers on the poster or on the board. 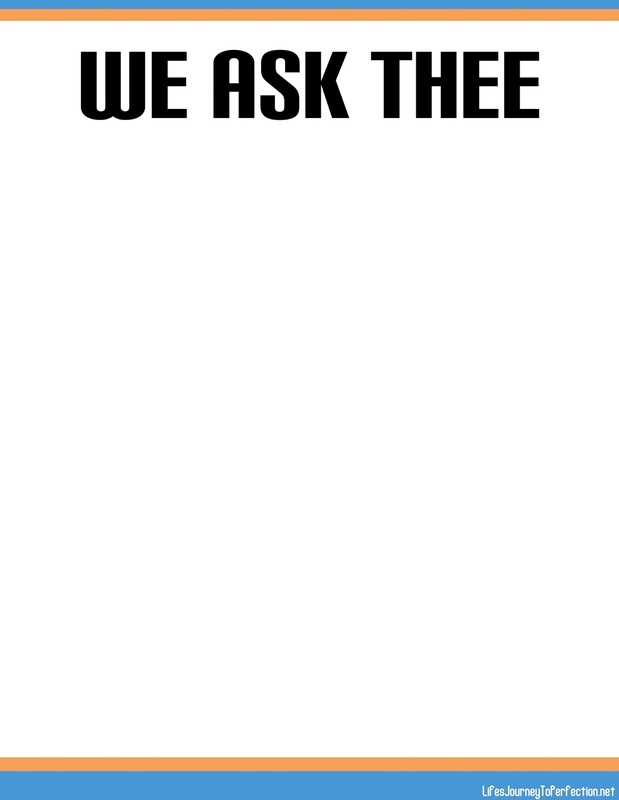 Next, show the poster that says, "We ask thee..." Explain that Heavenly Father also wants to know what is going on in our lives. He wants to know the things we are struggling with. In our prayers we can ask Heavenly Father for the help, for guidance, and to bless others. Ask the primary children, what some things are they could ask Heavenly Father for in their prayers? Write some of these answers on the poster or on the board. 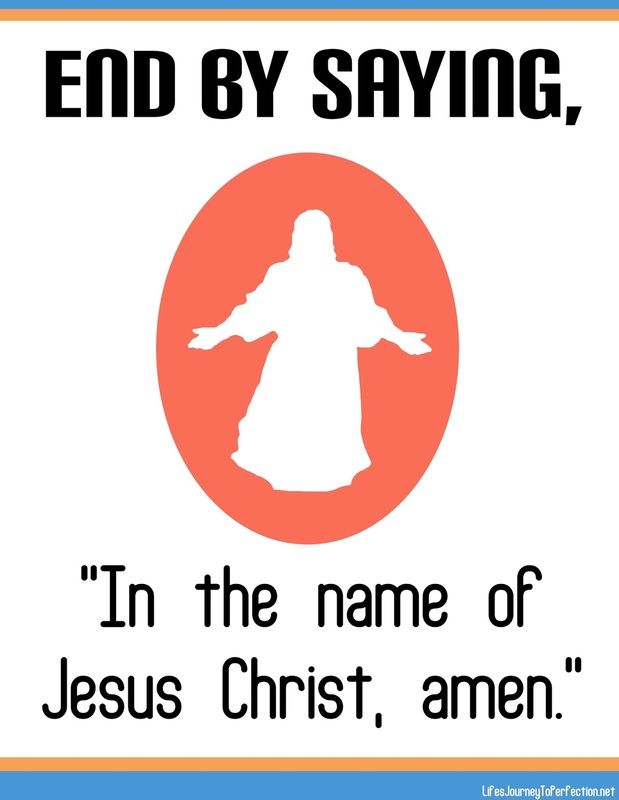 Next, show the poster that says, "In the name of Jesus Christ, amen" Ask the primary children what it means when they say AMEN? Explain that it means that we agree with everything that has been said during the prayer. Explain that Heavenly Father wants us to pray always to Him, he wants to hear from us. Heavenly Father will always answer our prayer. Sometimes it will not be how we think our prayer should be answered or when we think our prayer should be answered. But he will always answer our prayers and will answer them in the way that will bless us most. Give each of the primary children a paper and invite them to draw or write something they could pray to Heavenly Father about. If time allows invite some of the primary children to share what they drew or wrote. Such a simple and straightforward Sharing Time. Thank you for your ideas!! Thank you for the great sharing time!! !